CUZine #1 in the can! Look for it on the streets of downtown Champaign, Illinois, during this year’s edition of Roger Ebert’s Overlooked Film Festival. Any copies you see being handed out by volunteers or sitting in stores and restaurants between April 25 and April 29 are FREE! 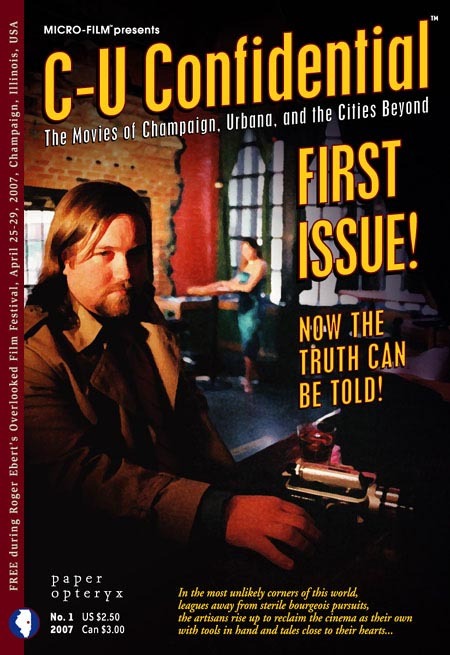 Grab one for yourself, maybe one or two more for friends, but please don’t be too klepto about it … The point is to spread the local film love as far and wide as possible through the magic of C-U Confidential! Click right here to learn about the contents lurking behind this mysterious cover featuring Mikel L. Matthews, Jr., and Becky Murphy. Let us know what you think after you snag a copy. We’ve established a brand-new e-mail – cuconfidential [at] gmail [dot] com – so remember to enter it into your address books! Our regularly scheduled wit and wisdom on C-U Blogfidential will resume shortly. Thanks again, folks! p.s This first issue would still be ink in a jar, paper on the shelf, and content rolling through our collective psyche without the gracious support we received from the following advertisers: 747 Productions, Blue Bassoon Pictures, Dreamscape Cinema, Exile on Main Street, Eye Trauma, Illini Film & Video, Mark Roberts, Michael Wiese Productions, Mike ‘n Molly’s, Moving Pictures Television Production & Services, Pamphlet Press, Papa Paris, PC Powerzone, Raycraft Productions International, Roselawn Productions, Route 66 Film Festival, Sine Fine Films, Springfield & Central Illinois Film Commission, and That’s Rentertainment/Parasol. Hopefully we have done you proud in covering an unheralded dimension of the artistic culture in downstate Illinois! This entry was posted on Sunday, April 15th, 2007 at 12:23 am	and is filed under C-U Confidential, MICRO-FILM du C-U. You can follow any responses to this entry through the RSS 2.0 feed. Both comments and pings are currently closed. 14 distant relations of Jan Tschichold dissected this page in 0.363 seconds while exacting sweet revenge in silence.